On this day in 1973, something happened that had not happened in over two decades: a horse won racing’s Triple Crown. 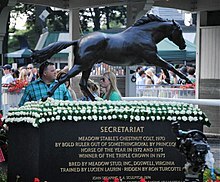 The name of the horse was Secretariat, and he didn’t just win the Belmont Stakes, he annihilated the competition, winning by an amazing 31 lengths. Other horses have won the Triple Crown since, but never has there been such a dominant performance on horse racing’s main stage. After the race, Secretariat’s jockey Ron Turcotte was as surprised as anyone at his horse’s amazing performance, saying “I know this sounds crazy, but the horse did it by himself. I was along for the ride” (1). You might say that Secretariat won “hands down.” If you did, you would be using an idiom that means “with no trouble, easily,” and it would be an especially appropriate idiom because the expression originates with horse racing. A jockey who is ahead of the other horses will relax his grip on the reins and drop his hands. In addition to horses, English features a whole menagerie of beastly idioms. 2- Ammer, Christine. Southpaws & Sunday Punches: And Other Sporting Expressions. On this day in 1789, a draft of the Bill of Rights was presented to the First Federal Congress. The United States Constitution had been ratified on September 17, 1787. It established the organization of the central government and the elaborate system of checks and balances on the power of the three branches. What was not included in the Constitution at this time, however, was how the powers of the central government should be balanced against the rights and liberty of the people. Beginning with the Magna Carta, signed by King John on June 15, 1215, there is a long history of attempts to balance the power of the state or the Crown against the power of the individual. The Bill of Rights is a high water mark in this history. Credit for championing the draft of the Bill of Rights goes to James Madison, who would later become the fourth President of the United States. Madison had been the major architect of the document that was written at the 1787 Constitutional Convention in Philadelphia, and in 1789 he demonstrated the same breadth of knowledge and the same skill in forming compromises as he argued for the Bill of Rights. Madison’s first draft of 17 amendments was approved by the House of Representatives, but 5 of the amendments were later shot down by the Senate. The state legislatures would later remove two more amendments. 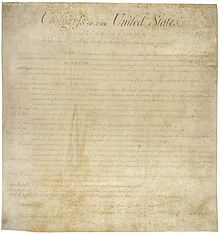 The first 10 amendments to the U.S. Constitution known as the Bill of Rights were finally adopted on December 15, 1791. What are the 10 amendments that make up the Bill of Rights, and what makes those rights so important? Today there are a total of 27 amendments to the United States Constitution, but it’s the first ten that are known as the Bill of Rights. Read each of the 10 amendments below. Then, research one of the amendments that you think is particularly important. Write an explanation of what this right means and why you feel is so important. On this day in 1955, the quiz show the $64,000 Question premiered on CBS. Today we take game shows for granted, but in the early days of television these “quiz shows” were high stakes dramas that mesmerized the television audience and posted record ratings. The $64,000 Question spawned a number of successful imitators: The Big Surprise, Dotto, Tic Tac Dough, and Twenty One. The success of the quiz shows ended, however, in 1958 when a scandal surfaced where evidence showed that the results of the shows were rigged. As a result, the quiz show craze died, and the networks stopped airing game shows (1). Game shows did not gain favor with the public again until the 1960s when shows like Jeopardy began to attract viewers (See March 20: Answer in the Form of a Question Day). In fact, it was not until the ’60s that the term game show replaced quiz show. It is interesting that tracking down the history of the word quiz has left lexicographers somewhat quizzical. One story involves James Daly, a theater manager in Dublin. In 1791, Daly supposedly made a bet with a friend, saying he could introduce a new word into the language within a single day. He then created the nonce (or nonsense) word quiz and paid people to write the word in chalk on walls throughout the city. By the end of the day, the word was on everyone’s lips (2). 2- Manswer, Martin. The Guinness Book of Words (2nd Edition). Middlesex: Guinness Publishing Ltd., 1988.